So, you think you want a turtle? THEY WILL GROW LARGE and FAST and LIVE 40+ years! 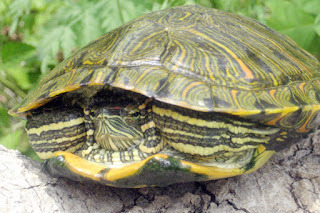 The Red-eared Slider (RES) is a medium-to-large sized turtle capable of reaching straight carapace lengths of 7 to 9" in males & 10 to 12" in females (note: in rare cases larger red-ears have been found). Male RES are smaller than their female counterparts, reaching ~ 7 - 9" adult SCL. Males have elongated front claws to aid in courtship and mating rituals & their tails are much longer than females. Many times people believe and are told by the vendors that the hatchling will not grow. WRONG! They will grow into the size of this paper very fast. Those cute turtle lagoons usually sold along the turtle are what we call “Death Bowls”. The images speak for them selves. Throughout their lives, RES are omnivores progressing from predominant carnivore as juveniles to predominant herbivore as adults. Be careful not to overfeed your Slider. 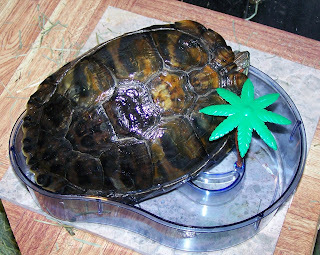 Recommended feeding only 2 to 3 times a week for adult turtles and every day or every other day for the rapidly growing hatchlings. Sliders will consume vegetables, greens such as mustard greens, turnip greens, dandelion, spinach, carrots, zucchini and any aquatic vegetation, i.e. duckweed, water lettuce, water hyacinth, etc. They will also consume insects, worms, snails and fish. Many of the commercially prepared turtle diets that exist on the market today are excellent Slider food. You must provide Calcium for proper shell growth. Powdered calcium can be sprinkled on foods. It is suggested that one use calcium supplemented with vitamin D3 if the animal is being maintained indoors and calcium without D3 if it is outdoors. Provision of a cuttlefish bone, which can be gnawed if desired, is also recommended. TEMPERATURE RANGE (°F) Air Temperature: mid 70's - 80's Basking Temperature: High 80's to low 90's Water Temperature: ~ 72 to 76 degrees for sub-adults & adults, 78 to 80 degrees for hatchlings & smaller juveniles. For single adult male RES could do okay in a 75 gallon aquarium. Single large adult females need a minimum of a 125 gallon tank. This allows them decent room (quality of life) in addition to plenty of water to assist in good health and filtration. Basking areas can be made of anything that will support their weight and is non-abrasive. Smaller enclosures tend to resemble prison cells. Would you like to spend your whole life in the bathroom size prison cell? Predator safe outdoor pond is the BEST! 1.) 125 Gallon glass aquarium combo. with fluorescent light hood & glass canopy: ~ $1,100. 2.) Oak Stand Cabinet: ~ $550. 3.) Black Clamp Lamp with Ceramic/Porcelain socket for heat bulb: ~ $25. 4.) 200 watt Stainless Steel submersible heaters: ~ $40. 5.) Rena FilStar XP3 Canister Filters with additional purchase of biomedia: ~ $200. 6.) Large Turtle Ramp (for female RES or big males plan to build your own platform): ~ $30. 7.) Digital Thermometer: ~ $10. 8.) 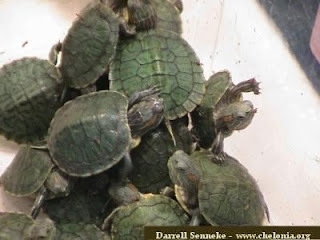 1 Can ReptoMin Aquatic Turtle Food: ~ $10 - PLEASE Check the care sheet for proper diet! 9.) Python System for water changes: ~ $30. 10.) 3 Bags of 'River Pebbles' from Lowe's (cheaper than pet store gravel): ~ $25. 11.) Active UV-B Heat (T-Rex)100 watt flood - ~ $50. (Lasts about 6 month) (Use in place of one of the fluorescent bulbs that came with your tank combo. with this bulb, nearest the basking platform).